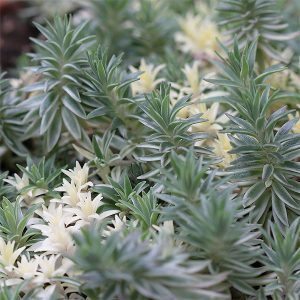 The low growing ‘cream and green’, Sedum lineare ‘variegatum’ is a carpeting succulent grown for the very attractive foliage. It grows well in containers, hanging baskets and also makes a good ground cover plant in the rock garden. The foliage has is a mid green edged with cream. New foliage emerges a creamy white. The foliage itself is soft with upright branches. Reaching around 5 cm in height and slowly spreading to around 30 cm, it requires similar conditions to other sedum varieties. Small yellow flowers in summer are an added feature. A well drained humus rich soil is best. Add some extra drainage material to soils that require amendment. In containers use a specialist succulent potting soil. A position in full sun to part shade, and, during hot dry periods a little additional water will help keep Sedum lineare ‘variegatum’ looking good. In very hot zones, try a little afternoon shade. In areas of deep shade growth tends to be a little taller and less compact in habit. Drought and cold tolerant, this is a succulent that is suited for use on a green roof, as well as a vertical garden. Try Sedum lineare ‘variegatum’ in a dry soil terrarium.